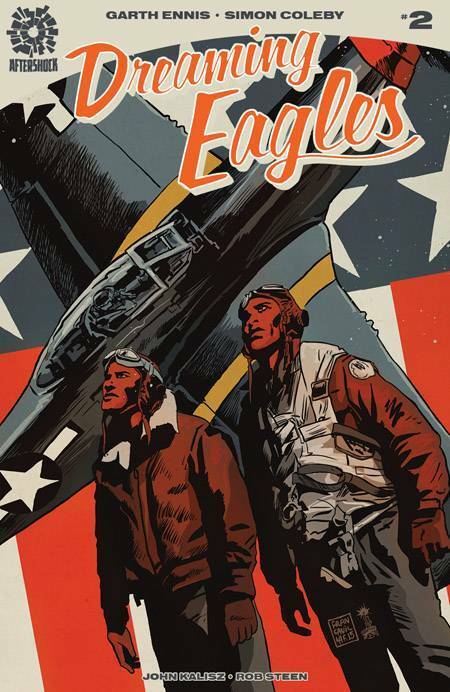 Dreaming Eagles is a comic book created and written by Garth Ennis and drawn by Simon Coleby. 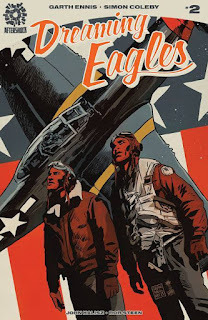 A six-issue miniseries, Dreaming Eagles tells the story of the first African-American fighter pilots to join the United States Army Air Force in World War II. The narrative connects the pilots' stories with the 1960s Civil Rights movement through two character, WWII veteran, Lt. Reggie Atkinson, and his son Lee, a Civil Rights activist. As Dreaming Eagles #2 (“Sunward I've Climbed”) opens, Reggie tries to explain to Lee the experience and feelings of flying an airplane. He then recounts the early struggle of Black pilots to gain acceptance and the difficulties facing other Black men who wanted to become pilots. Connected to the U.S. Army Air Corps Thirty-Third fighter group, the Black servicemen travel overseas to find that some things are the same as at home in the United States, as they prepare for their first combat. As much as the first issue of Dreaming Eagles intrigued me, I was equally curious about where this series would go. I am surprised that the second issue focuses so much on the bureaucratic obstacles that the Black pilots confront as much as it depicts the resistance these men face from their superior officers. This is all driven by racism, bigotry, ignorance, and everything bad that is rooted in the Jim Crow America which emerged late in the 19th century. Garth Ennis offers a story that reads like an oral history, covering both the larger details of the wider national and military history, but also depicting the more intimate details of a personal story. Yet Ennis also depicts the thrill of flight, both in training and in combat. This sense of drama is as exciting as the best moments of a good action movie. Artist Simon Coleby brings Ennis' script to life and captures every nuance and all the high-drama. I can't find the words to describe how wonderful is the manner in which Coleby depicts airplanes in flight and in fight. Yet Coleby also brings the same power and intensity, but quietly, when depicting the indignities the Black servicemen face. Even when these men take it with a “stiff upper lift,” Coleby shows the anger that simmers beneath these proud men. Dreaming Eagles #2 makes me even more curious. What's next with issue #3?